Lots of people dislike a lot of weird things. For example, former President George H. W. Bush was notorious for his dislike of broccoli. I love broccoli, but I cannot stand anything other than the mildest, whitest, blandest cheese, and then only on pizza. No cheese on tacos, no cheeseburgers, and definitely no nacho hats. 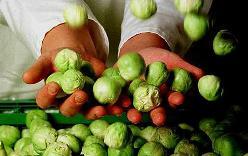 Commanding Officer Wayne Keble of the HMS Bulwark hates Brussels sprouts. So much so, in fact, that Commander Keble has banned the pungent green vegetable from his ship! The Bulwark is a warship, and Commander Keble has declared war on Brussels sprouts. He’s the commanding officer, and as such he can make whatever rules he wants on his ship. Will the Royal Navy complain? Does anyone actually like Brussels sprouts? I know they’re very low down on my list of veggies I like; if I were in charge of a ship I’d probably ban them, too (and my crew would no doubt cheer me for it). Kudos to Commander Keble! Thanks to this ruling, his soldiers will follow him anywhere there isn’t Brussels sprouts.